(Woman’s voice at the end:) Hey! Guess who’s got a new boyfriend! Like I mentioned in the previous post, it seems like a story will unravel as we hear more songs. The use of the word “Nimrod” set me off on a little biblical research since I’ve heard the name but wasn’t that familiar with who he was. In case anyone is interested, he was a great-grandson of Noah and was the king who was responsible for the Tower of Babel. Interestingly enough, according to one source (Rashi), Nimrod was a manipulator who ensnared people with his words. The reason this is interesting, of course, is because in the song, it appears that the narrator, whom we can assume is RS, is called “Nimrod” and in real life, RS’s lyrics have “ensnared” (but in a good way) many fans. Maybe I’m reading too much into it, but it’s keeping me busy until the next song is released. There was also news posted today about “The Snake King” being available for pre-order on red vinyl LP and in regular black vinyl, RS’s first vinyl release since “Rock of Life” in 1988. Or course the article mentions “Jessie’s Girl” in the first line, but RS seems to have accepted that eternal connection so I guess I should just get over it, too. Other than that, it’s a nice little article and it’s great to see that the album is already getting some recognition. I just had a weird experience and was wondering if anyone has an answer. This afternoon I’ve been listening to Rick and the Newsflash radio and all of a sudden this song plays that I’ve never heard before – “Hey Josephine” off of a limited edition of “The Day After Yesterday,” one of RS’s albums that I haven’t listened to. OK, so what’s weird about that, you might ask. Well, the weird thing is that it made me think of a song I wrote back in 1988 called “Hey, hey Josephine.” No, I don’t think somehow RS found his way into my little spiral notebook and got the lyrics (I wasn’t writing music at that time, but I remember the melody – I was attempting a ska sound as I was a big fan of The Specials at the time), but I was just wondering who Josephine is? Was it a character or something that I don’t remember? My song topics are inspired by so many different things, I have no recollection of where the name Josephine came from. Was the song “Hey Josephine” ever released earlier than the 2005 limited edition version of “The Day After Yesterday” that I might have somehow heard? I did a little more research on the song and found this explanation on the RS song on the wonderful Rick Springfield fan site, rickspringfield.us. AND I learned about another Josephine song called “Hello Josephine” that Fats Domino (may he rest in peace – he died last month) recorded in 1960. It was covered by many different artists, some of who changed the name to “My Girl Josephine,” “Josephine” and “Hey Hey Josephine,” the last one by the U.S. Army Airborne in 2006. 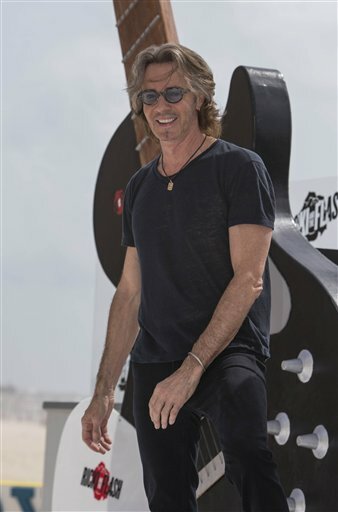 “Rick Springfield’s resume as a successful musician and actor need not be repeated here as it has been well documented many times over the years. What needs to be discussed here is that The Snake King will NOT be the Rick Springfield album you or anyone else was expecting. Rick, not for the first time in his career, has thrown a curveball that surprises and absolutely delights at the same time. The Snake King finds Rick travelling down a dusty dirt road to explore the blues side of his rock ‘n roll. All you have to do is check out two of the first couple cuts on the album, “In The Land Of The Blind” and “Little Demon” or also the title-track to get an understanding of the blues laden journey Rick had decided to allow us to join him on. Where there’s smoke, there’s fire. Between that and the symbolism of red (danger, energy, passion, aggression), I’m wondering if this is a hint of the feeling of the new album. Yesterday there were shots of a desert photo shoot and today the first glimpse of “The Snake King” cover! (No snakes…) And the announcement that the release date of Rick Springfield’s new blues album is Jan. 26, 2018, about two months earlier than originally anticipated! Andrew McNeice is the owner of melodicrock.com and a journalist/promoter in Australia and he shared some of the earliest information on “Rocket Science” back in 2016 (wow, was that only last year – how lucky are RS fans that we get two albums in two years?!) so you may want to keep an eye on his Twitter page. And MAYBE RS and the boys have been practicing a song or two from “The Snake King” and plan to play one at an upcoming show? Or, if like “Light This Party Up” and “Down” from “Rocket Science,” we’ll get to hear a song or two a little earlier?